In our community in northeastern Ontario, it has certainly turned heads in recent months. A church building being erected? When others are being shuttered? Do people even go to church anymore? And isn’t the Bible sort of passé? But sure enough! After 50+ years in our prior building, Bethel Gospel Chapel has moved this month to a high-profile location overlooking the Trans-Canada highway on the west end of North Bay. Our new building (at 15,500 square feet) is more than double our prior usable area. The facility is designed to be multi-use: our primary space is a large gym for children’s and youth activities through the week, and converts well to accommodate singing, preaching, and worshiping on Sundays. The plan has been almost 20 years in reaching fruition; we are reminded that some of those involved in planning, praying and giving over that period did not live to see the final structure. But they participated knowing that this was a marathon, and our multi-generational fellowship would get to the finish-line in the Lord’s timing. In recent months, we’ve had what we interpret to be the Lord’s confirmation and blessing: people coming to Christ, a greater hunger for Bible preaching and study, new people showing up each week to Family Bible Hour. And that trending has spilled over to our children’s and youth ministries. 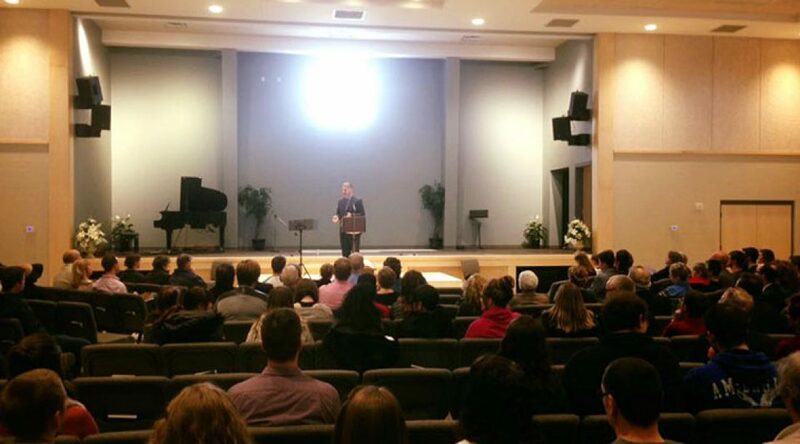 Our first Sunday morning in our new building – with Mark Anderson (Sudbury) preaching featured 4 baptisms! Our facilities are new, attractive and progressive, with contemporary lighting and heat. Because of the challenges of using a gym for Sundays, we’ve invested heavily in technology that will provide clear audio for music and preaching. upholding the authority of the Bible in our lives. This will be demonstrated by preaching, teaching, and studying the Word of God. We are dedicated as individuals – and a corporate body – to applying and obeying God’s truth in our lives, marriages, and families. committing to fellowship, sharing life together horizontally because of our vertical bond to Christ. Because we recognize Christ as Head, we support the delegated authority of our elders and deacons, and seek to utilize our spiritual gifts and abilities to serve each other and reflect the Lord Jesus to our world. engaging in individual and corporate worship of God, including the weekly observance and participation in the Lord’s Supper, to specifically remember the Lord Jesus as He has instructed. demonstrating an individual and corporate commitment to prayer, recognizing the power of the Holy Spirit is needed for us to accomplish our purpose as a New Testament local church. At Bethel, we call our vision Every Supporting Ligament. Our “vision verse” comes from Paul’s letter to Ephesus: From Him the whole body, joined and held together by every supporting ligament, grows and builds itself up in love, as each part does its work (Ephesians 4:16). March 12th-13th – run-up to Dedication Sunday with Dr.Kirk Durston. 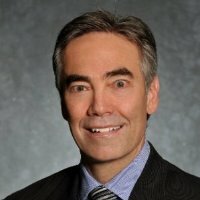 March 19th-20th – 2nd run-up to Dedication Sunday with Dr.Bill McRae. April 2nd-3rd – Dedication Sunday with Judge Ralph Carr. Randy, thank you for sharing this news! Many blessings to you and all at Bethel as you make this move. And thanks once again for opening your church home to many students like me over the years. Congratulations on the completion of such an honourable goal and vision! While I rejoice in reading about the growth of your assembly, I think it would also be interesting to talk about the decision to build bigger instead of hiving off to make a new assembly. Thank-you, and may our Lord continue to bless you. Hi Edi. That is definitely a good question. Why an assembly would move or build would need to be carefully thought out by each assembly. Let me give some thoughts on this as my own assembly is also going through the same process of building a larger facility. 1. The size of the community is a factor. It may be that the city where the assembly is located in isn’t large enough to have 2 separate assemblies. It may be far more effective to have one larger fellowship. 2. The purpose of the building. In our situation we are not building to accommodate many more people but our old building isn’t suitable for the different programs and outreach efforts going on. I can’t speak for North Bay but in general there isn’t a specific set of guidelines in the New testament about buildings or their size. Each local fellowship needs to be before the Lord seeking his plan for them.